All meetings start promptly at 7:30 (doors open at 7:00pm) with a break for light refreshments during the evening, finishing by 10:00pm. No charge is made for VERA members attending these meetings, and visitors (£2.00 admission which covers refreshments) will be made very welcome. As usual meetings will be advertised in the local press, some transport magazines and on this page. Please ensure you arrive early to get a seat and to allow the meetings to start on time. Joe Whicher takes us on a fascinating journey from Selsey to Chichester along this extraordinary line built by Colonel Stephens. It wasn’t really a tramway as we know it but then it wasn’t like any other railway either! 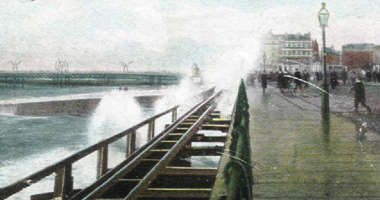 Blackpool is one of the best known tramways in the UK but the early days, when conduit was used, is not so well known. Our speaker, Blay Whitby, takes a look at the work of another pioneer of electric traction, Michael Holroyd-Smith, his conduit systems as used in Blackpool and its subsequent development. Not all our talks are transport-based and this is one of them. Janet Pennington visits the inns of Sussex to look at their signs and investigates their often quirky history. With this presentation you will get two speakers for the price of one! Ian Gledhill will trace the history of this early electric interurban electric line, a true survivor through the often difficult times and John Zebedee looks at the present scene and the celebrations of its 125th Anniversary.